The Straxfix Orthopedic System is a four step process. The Straxfix® Orthopedic System requires no changes to current procedures for treating a fracture. The mobility of the battery operated Straxfix Light permits treating patients in any ward or treatment room at the hospital or clinic. The stockinette and padding to be used, can be found on the shelf of any hospital. The Straxfix® bandage is a one size bandage that is ready to be used straight out of the package. To fit it to the patient, use a pair of regular scissors to custom fit. Once satisfied with the repositioning of the fracture, place the Straxfix® light over the bandage. Position the lamp using the transparent shield, and press the button to start the light. It will turn automatically off when the bandage is fully hardened. 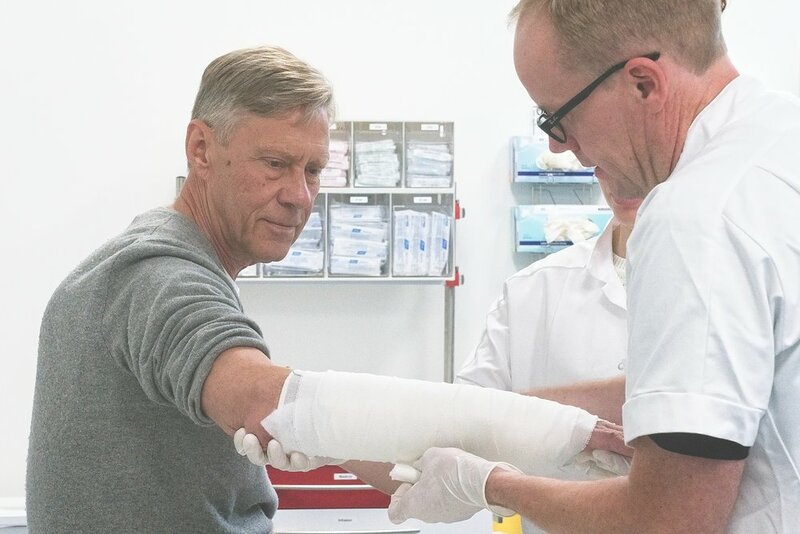 The Straxfix® Orthopedic System enables orthopedic doctors and nurses to harden a cast or splint in 30 seconds, and to send the patient home with a fully hardened cast or splint. The bandage is light-weight and the short hardening time makes the process patient-friendly. The bandage is waterproof, but we do not recommend exposing the fracture to water because of the padding. The bandage can easily be removed by simply lifting it off, when recommended by the orthopedic surgeon. No band saw required.